This dress is super romantic with its dreamy watercolor floral print, and it would have been the perfect dress for my anniversary dinner with Dr. S a few weeks ago. Too bad I completely forgot that I bought it! It was tucked away in the corner of a room, still wrapped up in its bag. I tried to justify my poor memory by telling myself that I bought it when the weather was much cooler and hence it wasn't front and center in my mind. The truth is, I just have a really really bad memory. Or as Dr. S would say, maybe I just shop too much? I wore this dress instead to our residency graduation this past weekend. It's always fun to see your work colleagues out of ill-fitting scrubs and dressed up to the nines. Sadly our evening was cut short when Dr. S got paged out to see a patient in the hospital, but we at least got to enjoy most of our dinner together! 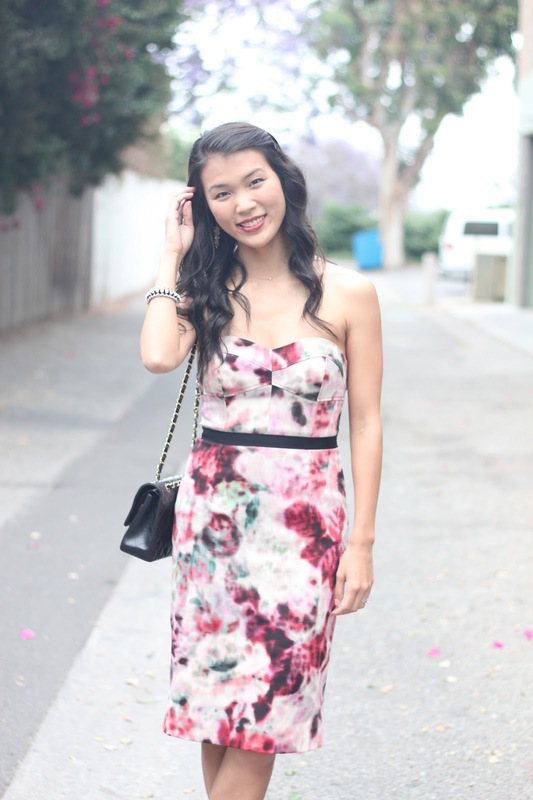 Pink floral strapless dress: Moulinette Souers 'Hedgerow Corset Sheath' from Anthropologie (also cute). Black blazer: Theory (similar here). Handbag: Chanel medium flap bag. Earrings: gift from friend. Bracelet: DIY seen here. Necklace: Tiffany&Co./anniversary gift from Dr. S. Shoes: Zara. such a pretty dress! and i LOVE your hair!